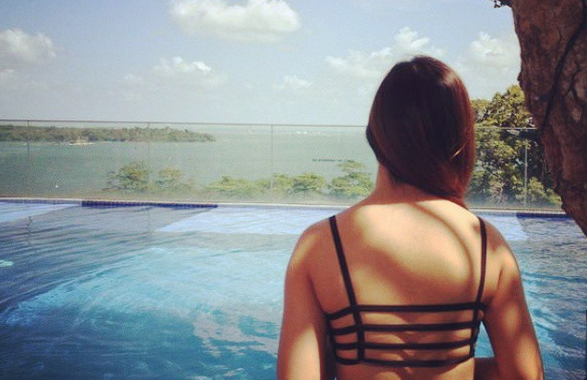 SG Budget Babe: Should Investors Rejoice Over OSIM's Takeover Offer of $1.32 Per Share? 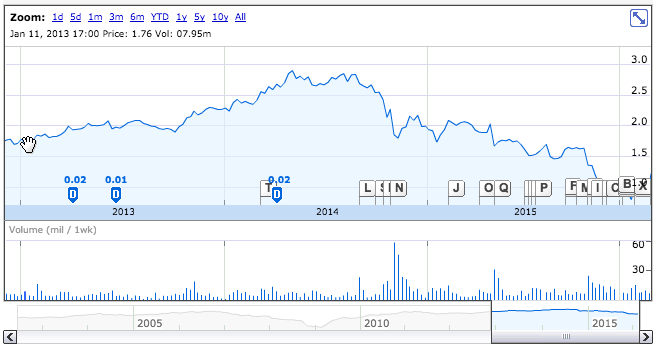 Should Investors Rejoice Over OSIM's Takeover Offer of $1.32 Per Share? Many of us were keeping an eye on OSIM when it was announced that there would be a trading halt to OSIM shares on the stock market since last Wednesday. Today, CEO Ron Sim announced a takeover offer in a bid to privatize the company. For investors who own OSIM shares, could this be good or bad news? Well, that depends on when you bought OSIM. For many investors, OSIM was a darling stock, especially during its spectacular rise between 2012 - 2014 which came after 22 consecutive quarters of record profits. The brand, familiar to almost everyone on the street, also includes its subsidiaries GNC and TWG, which are all synonymous with massage chairs, health supplements and luxury teas respectively. 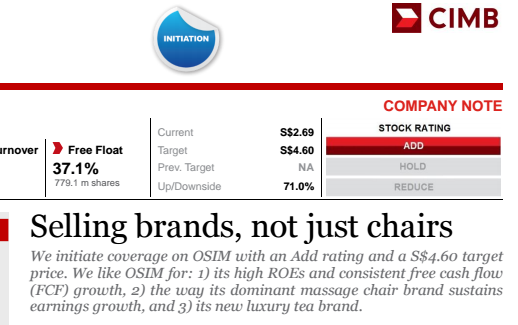 With over 840 outlets combined across the three brands, OSIM was touted as a good growth stock to invest in, especially with its foray into opening outlets overseas in a bid to grow beyond just the Singapore market alone. Value investors also favoured the stock for its strong branding moat, which isn't a feat easy to achieve for any retail chain. Its P/E ratio was also reasonable at 15x. Analysts and brokers were recommending this stock to their clients, and its share price climbed steadily and rapidly throughout 2013 - 2014. Some analysts were even recommending significant upside for the stock, with a target price of as high as $4.60 touted by CIMB. 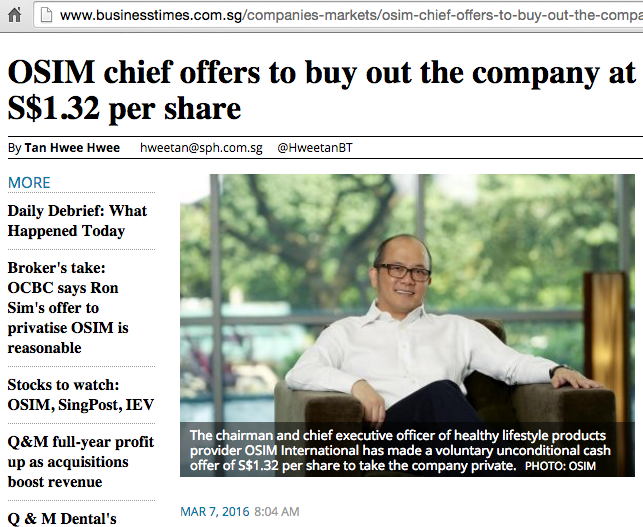 But let's face it, sales of OSIM had been dropping ever since its heydays. When I was younger, I knew a lot of families who owned at least one OSIM product, including my own household. However, in recent years, the hype over OSIM products seemed to be dying down, at least within my own social circle. Did I still think it was a good stock? Of course. But I wasn't sure if it would soon see a crash in its stock price, given what I was noticing around me. 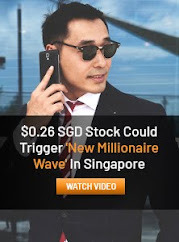 I knew the Singapore market wasn't its only source of revenue, but if Singapore wasn't doing well, I wasn't sure if the same would happen to its other overseas markets. Sure enough, 2015 then marked a huge decline in its stock price, which plummeted from over $2.50 to under $1.50. At one point, it even dropped by as much as 50%. When I started investing in 2015, I was too afraid to go in, given the downtrend that I was observing. But in various stock forums, people were still advocating the buy. 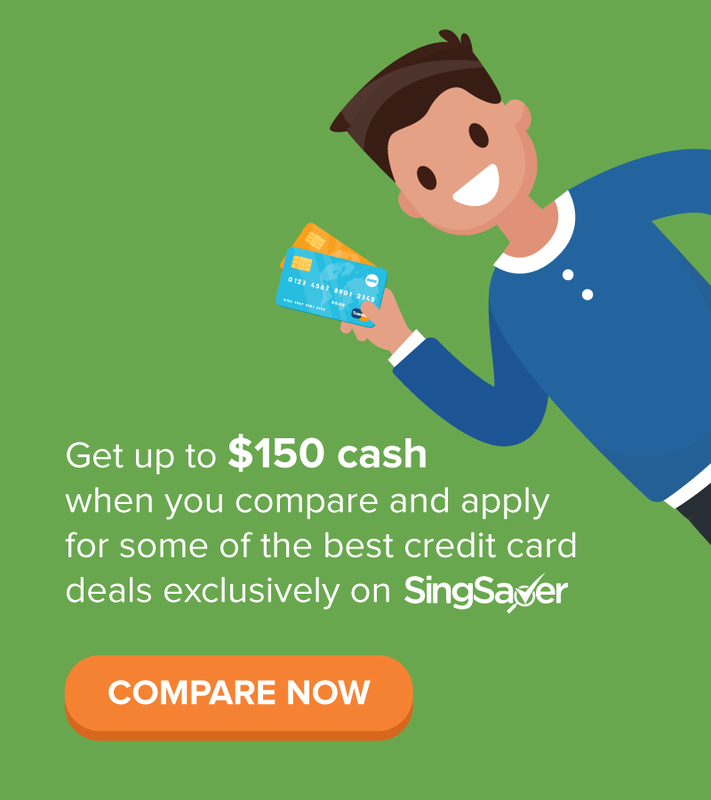 Today, with CEO Ron Sim's offer at $1.32, would you have benefited? For investors who had bought during its uptrend between September 2012 - August 2014 when it was touted as the next multi-bagger, or those who continued to buy during its downtrend from August 2014 to October 2015 (believing it to be a value stock / in its growth story), this offer price comes at a significant loss to them. But if you had piled on anywhere between December 2015 to last week, then you would have made as much as 70% in capital gains. I shrugged it off and did not believe in its growth story in 2015, so naturally I missed out on the chance to profit. But that's okay. 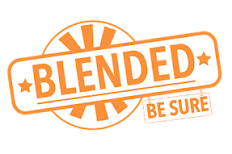 If I had listened to the analysts or the voices of the herd and joined in the call, I would be more sorry today. Lesson learnt? Take what the analysts say with a pinch of salt. For the record, I never believe any of the target prices they tout in their reports. You should always work out a fair value yourself and decide if a stock is worth your money. Don't just rely on the analysts or heed other "experts" calls. Now, how would those who bought OSIM thanks to a favourable analyst report back then (or in this case, CIMB's) feel today? Good points! From my experience, they miss their TPs half the time. I have the same thoughts as you on OSIM when I started equities investing last year. 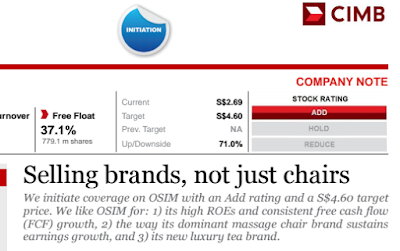 It is a pity OSIM isn't able to take advantage of their GNC and TWG entities which are much more appealing products. It always pays not to follow analyst's reports blindly without doing homework on the companies to invest in. Glad to know I'm not the only one who thinks this way! Unfortunately, there are plenty who blindly follow analyst reports thinking the analysts are the "experts" anyway.